Natchez, Mississippi was founded in 1716 as a fort on the Mississippi River. It was founded a full two years earlier than New Orleans (a major source of local pride). This breathtaking Southern town is filled with sweeping Antebellum estates, a bluff that overlooks the river, and Southern Charm in every nook and cranny. I love the graceful old homes that line the streets, massive magnolias and Spanish moss that seems to hang from every surface that won’t move. The slow pace of everything but the kudzu growing harkens back to another time. Natchez (the t is silent Na * chez) overflows with quirky stops and lovely homes, tours, and eateries that are famous for everything from tamales to fried chicken. This was once the start of a major trade route between Natchez and Nashville. 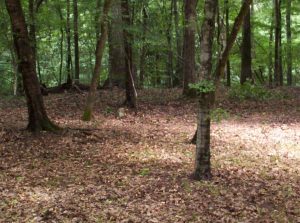 The Natchez Trace is still drivable and has portions where you can see the heavily walked trails that made up the old trace. The heavily trod trails are still scars across the earth now – now, shrouded in leaves and laying quite, you can easily imagine the kaintucks walking back up the trail, headed back to Nashville after a river voyage to bring goods to the points south. 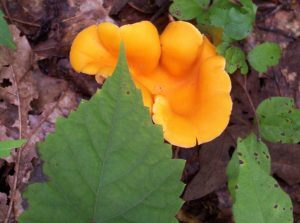 Mariweather Lewis even made a stop or two at inns along the old trace during his explorations (and his final exploration as he died along the trace near Hohenwald, Tn). 5. Antebellum Homes – My favorite of the Antebellum Homes is Dunleith, though Monmoth is a close second. Pictured above are Dunleith and Rosalee, my third favorite. How can you really pick a favorite – they rotate. This amazingly beautiful property, once a plantation home, is now a very chic bed and breakfast. I love the columns that ring a wrap around front porch, lined with rockers. It is lovely to make a reservation at the restaurant, sip a sweet tea and watch the sun go down over the Delta. Other homes of note are Longwood, an unfinished octagonal structure, and Stanton Hall – you can even take tours of this home supported by the Garden Club. Monmoth is another amazingly well preserved home with sweeping views and stunning interior design that takes you back to days gone by. 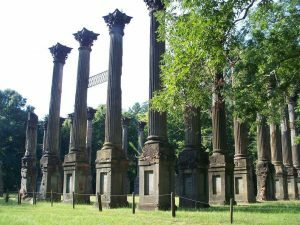 If you enjoy short drives, the ruins of Windsor Plantation home are just up the road – this is one of the most photographed locations in the South. 4. Fat Mamas Tamales and King’s Tavern – Two of my favorite places to eat in Natches are dynamically different from each other. Fat Mama’s Tamales has, hands down, the best restaurant tamales I have ever had. These tamales are so good that they are regionally famous. 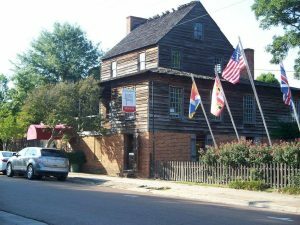 King’s Tavern, the oldest building in Natchez (and reportedly most haunted location in town) has four star meals that are fit for a king. Other local favorites are many, serving up fried chicken, mile high meringue pies, and all things Southern. Don’t think you are going to stay on a diet during your visit to Natchez! 3. Carriage Rides – You can pick up an easy and inexpensive carriage ride around town. You can pick these up near the site of William Johnson’s home. Mr. Johnson was an African American barber in Natchez. Mr. Johnson was a free man of color who was raised white. While he was biracial, in the antebellum south, anyone with African ancestry was considered black. He trained to be a barber under the direction of his brother in law, a Philadelphia native, and eventually owned three shops, a bath house and eventually, a farm. Ironically, his desire to improve his own social standing led him to own slaves – from which he greatly profited. By the time of his death, his property holdings were substantial, both land and human. Near his home is the old rail road depot. The depot houses vendors and shops, and carriage rides are located near here. 2. 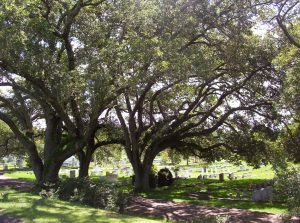 Natchez City Cemetery – I realize this is an odd addition, but I love to stroll among the resting places of the Natchez City Cemetery – especially near sunset. The cemetery sits up on the bluff overlooking the river and delivers amazing vistas as the sun sets. Amazingly beautiful monuments litter this cemetery, and one is especially famous. 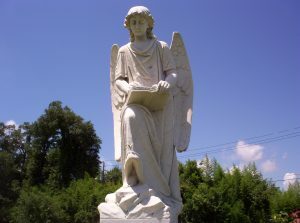 The Turning Angel is said to watch as people drive by during the evening, keeping watch over her charge. As you drive by, you can see the Angel in the glow of your headlights, locals swear that the Angel turns to watch as cars pass by. 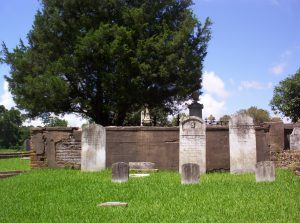 In addition to the amazing funerary art, the cemetery is famous for notable Natchez plantation owners, historians, and a couple of local residents that you will want to “meet.” Florence Ford is one that captured my attention. She died at age 10, and had a particular fear of thunder storms. Her mother had a special coffin built that had a pane of glass near the head of the casket. She then had stairs installed so that she could descend during storms and sit with her daughter to comfort her. You can still see the stairs, but the city sealed the opening to the viewing pane years ago in hopes of thwarting vandals. My favorite grave belongs to Louise the Unfortunate. This grave is not ornate like some of the monuments that surround it, but it belongs to Louise. 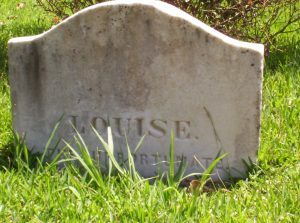 Not much is known about Louise, except that at her death, someone was fond of her. They anonymously paid for her burial and grave stone so that she would never be forgotten and would rest easily in death. I strongly suggest taking a guided walking tour of the cemetery so that you can get the full experience of the lore surrounding some of the more notable residents. Don’t forget to leave a coin or some flowers for Louise. There is even an old slave cemetery near by. I love to visit these places, largely overgrown and uncared for, to pay tribute to those whose names only history remembers. 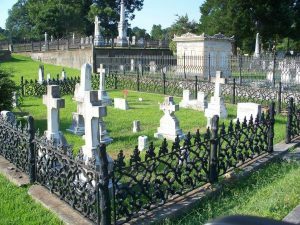 Be aware that graves are not marked, the ground is uneven as graves have settled, and you may be walking on some of Natchez’s first citizens. All that to ask that you be respectful of their resting place and try to not do any inadvertent damage to an already disintegrating burial ground. Ask locals for directions. 1. Under the Hill – My favorite place to stroll in Natchez is the street on the riverfront and under the bluff known as “under the hill.” Officially named Silver St, under the hill has a mariners museum, casino, several shops and eateries, and one particularly famous saloon/bed and breakfast. The “Under The Hill Saloon” is a no frills, hang out where locals and visitors mix and mingle, share stories and have a few cocktails as the hours grow small. The flat boat landing had the reputation as being the most raucous on the entire river with highway men, thieves, and all manner of individuals making their living doing various and sundry things (both legal and not) along those shores. 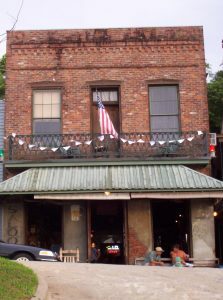 The saloon is now housed in a 200 year old building that was once a brothel and full of river memorabilia and memories. Sit at one of the tables near the open windows or have a beverage in one of the rockers outside and imagine all of the happenings of 200 years past. If you can stand the noise of the late night crowd and don’t mind sharing a bathroom with other guests, the Mark Twain Guesthouse is located just upstairs from the saloon. Papa Bear and I spent a particularly fun fourth of July there one year before the tinies came along. We were able to catch a seat at one of the window tables and watch the fireworks over cocktails, perfectly framed by the window. It was PERFECT!!! I’ll never forget those fireworks or my first trip to Natchez. Papa Bear grew up not too far from there, so when we visit Mississippi Natchez, Vicksburg and Oxford are all on our circuit. I equate Natchez to begin the Savannah of the Mississippi River. They had river pirates, Savannah had sea pirates. 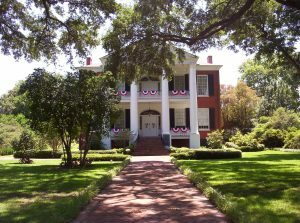 Natchez has antebellum homes and quirky residents just like Savannah. And when I say quirky, I mean down right quirky. That being said, I do believe they are my tribe. I love the Southern-fried charm, the down home cooking and the odds and ends that make up both cities. You can read about our adventures in Savannah here. Papa Bear likes to visit at least once a year now, most of the time with Tiny in tow now that she is old enough. I love to see them bonding over his roots. Occasionally Teeny and I accompany them and have a great time, but there is nothing like the bond between father and daughter to warm a Mama’s heart. Check out Natchez and tell me what you found that wasn’t in this top 5. I have always wanted to visit this area, but have not had a chance to. 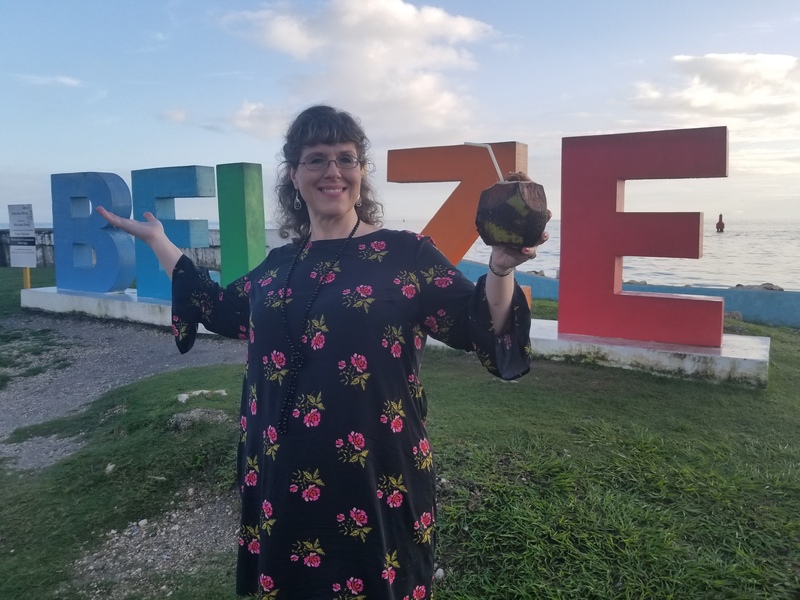 Thank you for sharing your experience and letting me dream a little more about someday! We go about once a year to curb Papa Bear’s homesickness. It is so pretty! If you ever get the chance, New Orleans is pretty close as well. That is a beautiful B&B, I feel like watching these TV shows with this building structures. Oh my goodness. Go to the web site and check it out. You’ll start talking like Scarlet O’Hara! I would love to stay at Monmoth one day. 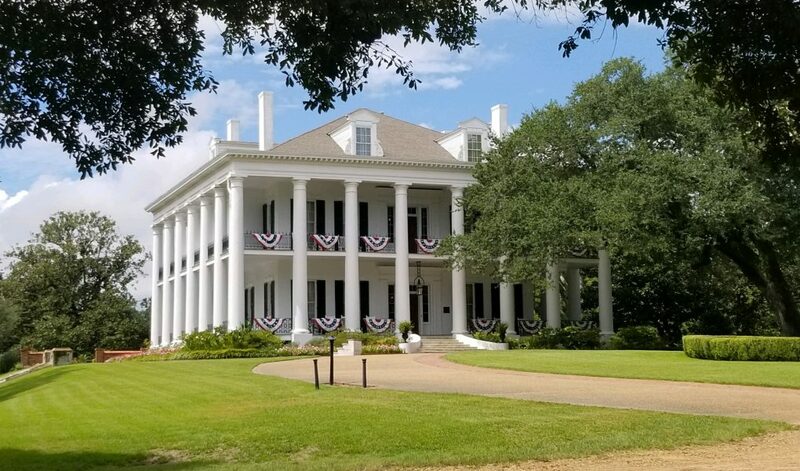 What a lovely place, it would be so much fun to see it in person, especially the beautiful Antebellum homes! They are stunning. Most are now Inns or B and Bs. I would love to stay in one for a couple nights, but the kids have to get a little ok older first. Can you imagine a 3 year old in one? Eek. 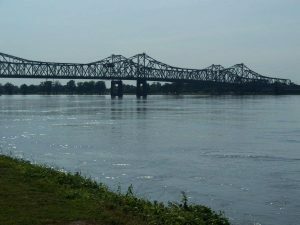 My hubby and I are preparing to go RVing full-time…Natchez looks like a great place to visit! A former professor of mine bought an amazing RV and taught remotely from all over the US. I have wanted to do that ever since. You would love Natchez, then make the swing on down to New Orleans. 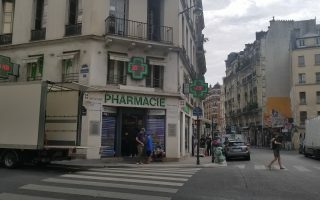 It is a lovely little place. I really enjoy it.